Gather in the lobby of the Al Bustan and Crowne Plaza for 11am departure. The drive offers tantalizing glimpses of the sea as we drive past the fishing village of Quriyat, where there is a good chance of spotting flamingos and eagles at an inland stream. At 1:00pm we reach the Bimah sinkhole, a limestone crater with blue green water at the bottom. We then will proceed to the Wadi Shab, where we will have a late lunch at 2pm. It is possible to walk right up to the source of the Wadi through lush green plantations of lemon, banana and dates. The fairly easy walk on a rocky path is dotted with pools and waterfalls. Comfortable walking shoes are recommended, however, walk is only recommended for fit travellers. 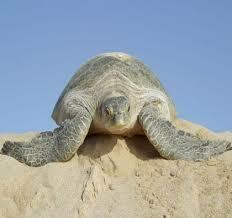 We reach Raz Al Hadd and check in at Raz Al Jinz Turtle Reserve where we will stay the night. Oman is a vital area for Green Turtles in the Indian Ocean and the Green Back Turtle are heavily protected by the government of the country. In fact, over 275 of the Sultanate's beaches double-up as nesting grounds for five of the seven recognized species of sea turtles, the most common being the Green Back Turtle. After dinner at 9pm we are led to the beach to see the female Turtles return to their beach to lay eggs (Please note there may or may not be turtles every night). At 9am we proceed to Sur to see where dhow traditional boats are made. We then drive to Wadi Bani Khalid, another scenic Wadi of Oman, passing the village with its endless date plantations. The pools of Wadi Bani Khalid are cool, deep and fresh, so feel free to plunge in and experience the crystal-clear waters. We'll have lunch with a Bedouin Family before heading to Wahiba. Quickly check in before heading to the dunes for the small adventure drive to the top of the dunes to enjoy sunset. Dinner will be at 7pm followed by an evening by the camp fire under the stars. After a relaxing breakfast with a desert view you'll depart for a 9am checkout and proceed back to the Muscat International Airport in time to catch the 13:55 OmanAir Flight to London. Prices include: Airport pick ups. Transport in air-conditioned 4x4 vehicles. Accommodation for (2) nights in above mentioned hotels. Breakfast, lunch and dinner (alcohol is not included). Prices do not include items of personal nature like drinks, laundry, telephone calls, tips, camera fees etc. Liability for change in itinerary due to reasons beyond our control. Gather in the lobby of the Al Bustan at 10:45am for 11am departure to Sur. The drive offers tantalising glimpses of the sea as you drive past the fishing village of Quriyat, where there is a good chance of spotting flamingos and eagles at an inland stream. At 1:00pm you will reach the Bimah sinkhole, a limestone crater with blue green water at the bottom. You then will proceed to the Wadi Shab, where you will have a late lunch at 2pm. Oman is a vital area for Green Turtles in the Indian Ocean and the Green Back Turtle are heavily protected by the government of the country. In fact, over 275 of the Sultanate's beaches double-up as nesting grounds for five of the seven recognised species of sea turtles, the most common being the Green Back Turtle. Gather in the lobby ready to depart by 10:00am. After breakfast you will go to Sur to visit the Dhow Factory to see work carried out using traditional methods and materials. Taking up to a year to construct, the dhows are made primarily from teak and cedar wood using hand tools. You will then be driven in two 4x4s to the offices of the Royal Cavalry in Madinat al Adiyat in Seeb to meet Saif Ali Al Rawahi and Brigadier General Abdi Al Shahwarzi. You’ll then be taken on a private visit of the Royal Cavalry and will have lunch at a stud farm with friends of Saif who own the Olympic Equestrian Training Centre. From there you’ll go to the camp and ride in the afternoon followed by dinner around the fire and sleeping under the stars. The next day will be a full day of riding in the morning and afternoon and perhaps a swim in a wadi, before dinner by firelight and a last night in the wilderness. Riding again in the morning and you will be transferred to the Chedi hotel after lunch on the 7th. Your luggage can be stored during the trek. The camp will be authentic with tents and breakfast and lunch and eating by the glow of the fire in the evening. Please bring comfortable clothes. After a full morning’s ride and lunch, you will reach the Chedi Hotel in the late afternoon. The Chedi is a luxurious contemporary hotel of understated elegance located north of the the city of Muscat and only fifteen minutes from the airport. Relax and enjoy your last night by the long pool (the longest in the Middle East) or luxuriating in the 800 square meter spa in Asian Zen-style. It's the perfect place to relax after your desert adventures and, with the airport only fifteen minutes away, it's the perfect place to spend your last night in Muscat. A car will pick you up to take you to the airport so that you can return home to reality again. Prices include: all transfers, two nights trekking with all dinners, tours, excursions included. This is a one-off individual tour created for Scots in Oman! Insurance mandatory. One night tour of Sur and a visit to the Turtle Reserve plus one night's stay at the Chedi Hotel. Prices do not include: Items of personal nature like drinks, laundry, telephone calls, tips, camera fees etc. Liability for change in itinerary due to reasons beyond our control. A former officer of the British Royal Marines, Sean Nelson has been organising specialist bespoke insightful journeys in Oman for decades for Mick Jagger and all sorts of illustrious clients. Recommended by Lucy from Banyan in India, we've convinced him to pull out the stops and show us the parts of Oman rarely touched by tourists. That's why we've chosen Dhofar. Mass tourism still hasn't discovered this region of Oman, however because a huge amount of money has been invested in new roads, a new airport and the recently opened new five star luxury hotel, the Baleed Anantara (where you will be spending your last night) it soon will, so the time to see this area is NOW. 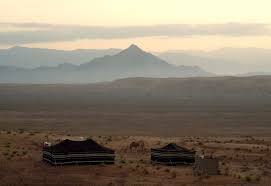 We use both large white bell tents and more traditional, Bedouin tents. For beds we use a comfortable, double mattress and made with good quality cotton sheets, duvets and pillows. Each pair of tents will share a well-appointed bathroom tent, equipped with a shower and a long drop loo with proper seat, wash basin and environmentally sound shower gels etc. We pride ourselves on cooking freshly prepared meals in camp. We source local ingredients wherever possible and aim to produce authentic regional dishes. We like to cook on open fires and a traditional hot stone Dhofari barbecue. Dinner is served at a laid table under the stars and beside a fire. A central ‘Majlis’ area is set for relaxing in, with shade, rugs and cushions. We are a mobile camp and whilst at times we will be able to set up the camp before you arrive, this will depend to a degree on the route we choose and at times, the ‘camp’ vehicle may need to travel with us, for safety reasons. In this case, we will set up as quickly as possible, whilst you explore the area or relax. Our light ‘expedition’ camp is well suited to the environment, comfortable, efficient and with no impact on the unique environments that we are privileged to find ourselves in. Hotel. Please make sure all bags are tagged with your names. nighttime temperatures can drop to around 12 in the mountains and desert. We will have a campfire each night. There is variable coverage in the area and good 3g not far from the camp, which we can take you to as needed. You will be able to charge camera batteries and phones in the cars only. Pack one suitcase of your formal clothes and a second one for the desert, and be checked out and ready in the lobby of the Al Bustan at 6:30 for yet another life-changing adventure. It’s an easy local shuttle to Salalah, where Sean and his team will be waiting with four-wheel drive vehicles. Suitcases of formal clothes will be sent to the Anantara and you will be whisked into the wilderness. We will head straight into Salalah to visit the frankincense souk and to Salalah’s vibrant food markets. Salalah is the capital of Southern Oman and sits right on the sea and alongside miles of white sandy, coconut palm fringed beach. The city has a very different, almost East African feel when compared to Muscat and is steeped in history that dates back to a time when the the area was a wealthy trading centre, shipping frankincense across deserts and oceans to the Levant and east into Asia. By late morning we will head out of Salalah and take the coast road north to The Queen of Sheba’s old frankincense port for a quick visit and then head up to Wadi Dharbat for a picnic lunch. This is one of Oman’s most beautiful and verdant wadis famous for it’s perennial, blue water, rich vegetation, caves and wildlife. We will take a walk up the wadi for around 30 minutes and find a good spot for a picnic. After lunch we will head across the Dhofar Mountains, where we can get a feel for the unique geography, tribal culture and history that defines the Dhofar region. We will drop down on to the main Salalah to Muscat road and head north to Thumrait before heading west across the Negd Desert and towards the Empty Quarter Desert. By late afternoon we will leave the tarmac behind and head across country towards the Desert. This is the largest sand desert in the world and one of the last great, unspoilt wildernesses. A truly magical place that will somehow stay with you forever. With an endless view north over the largest sand desert in the world, this is a truly memorable experience, completely empty; an awe-inspiring invasion on the senses. A walk through the wind sculpted sands reveals the huge diversity of shapes, colours and textures in the sand and a surprising number of small hardy plants. Our approach to the camp, will be across the sands and we will aim to arrive by around 6pm for a chance to climb a dune for a drink as the sun goes down. Dinner will be served under the stars beside a fire. The desert is a great place to wake up and if you can muster the energy, I suggest a walk to the top of a dune to watch the sunrise..we will organise tea and coffee at the top as a reward. After a leisurely breakfast we head off from the camp and deeper into the dunes for an explore and a picnic. This is an opportunity to learn some sand driving skills and we will be happy to let you take the wheel and to give you some instruction in how to drive in the desert…great fun. Back to camp for tea and time to relax before sundowners and a dune climb. Dinner under the stars and for those who are keen, we can bring your beds out of the tents and set them up under the stars. can you spot our tiny camp? A reasonably early breakfast, before heading out of the desert and taking the fast road to Thumrait, past three thousand year old triliths and areas scattered with fossils and a brief stop at the fabled lost city of Ubar. We will stop on Thumrait to take lunch in an excellent local restaurant then head into the Dhofar Mountains and begin the crossing near Qeiron Heritti. Mohammed’s uncle lives near here and we may stop for ginger tea with him and to visit his camel herd, depending on the time of day. Otherwise the scene here is more reminiscent of the rolling hills of Kenya. Cattle, rolling vegetated hills of craggy limestone and traditional stone round houses…a complete contrast to Northern Oman. We drop down the far side of the escarpment and may stop to visit a truly wonderful ‘family’ of enormous Baobabs, set in their own private valley and completely unique in Oman. Once down on the coastal plain, we head north along the coast via the small town of Mirbat [scene of one of the most important and heroic battles of the Dhofar Campaign] and then off road to our small, private beach camp, set on a white sand beach between two rocky headlands. We will arrive in time for a swim in the Indian Ocean before sundowners and dinner under the stars. Following a leisurely breakfast, served on the beach and a morning swim or snorkel, we will head slowly back towards Salalah. The plan is to reach your hotel after lunch and there are various local trips on offer along the way, including a visit to the charming old port of Mirbat which in 1972 was the scene of a heroic battle between forces loyal to the Sultan and Marxist insurgents. All the key features of the battlefield are still easily identified. The old part of the town still boasts some of Dhofar’s unique architecture and a stroll through the streets and alleyways leading to the sea front takes you back in time. In the early afternoon at 4pm you will be dropped off at the Al Baleed Anantara hotel. Relax, wash the desert sand away, have a swim, and if you’d like, Dena will be arranging a table for everyone to have dinner together one last time to celebrate these magical few days. After an enjoyable morning and a hearty breakfast, check out and meet in the lobby for a short fifteen minute ride to the airport at 9am to catch the WY 907 flight to Muscat at 11:15am to catch your onward flight home. Prices Include: All airport transfers. 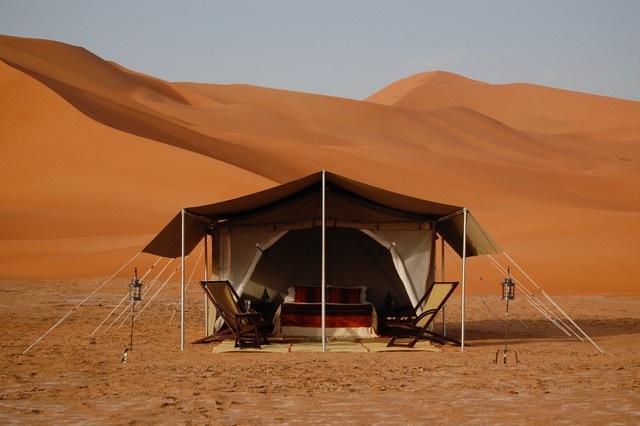 Accommodation for (3) nights in luxury tent (couples share tents). Breakfast, lunch and dinner on all days in camp. Deluxe seaview room and full breakfast at Anantara Hotel, Salalah. Flight from Muscat to Salalah on economy class. Entrances to all monuments. This is a unique, one of a kind and once in a lifetime tour created especially for Scots in Oman! by Sean Nelson, so we will be traveling in our own caravans and with our own tents and vehicles. Prices are all inclusive of just about everything you can imagine, but do not include liability for change in itinerary due to reasons beyond our control.